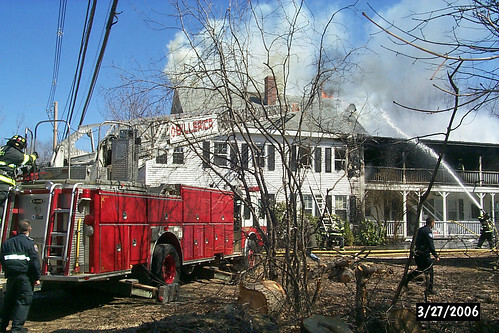 Flames tore through the second floor and attic of a 19th century home in the town’s Historic District yesterday morning leaving three families homeless. 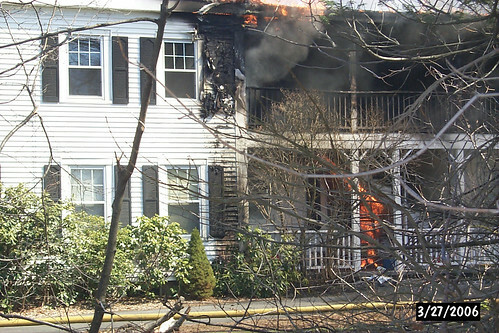 Firefighters responded to reports of smoke yesterday at about 11 a.m., when they found the white, three-family home fully engulfed in flames. Built in 1857, it only took minutes for the fire, which started on the second floor, to rip through the wood-framed house as firefighters battled flames that had penetrated the roof. “You can’t imagine how this feels. I don’t know what I’m going to do. There’s nothing left they tell me,” said resident Donna Sperry, crying in the arms of her elderly neighbor’s daughter. Sperry lived in the two-floor apartment at the back of the house for less than two years with her daughter Courtney, 15, and her son, Joseph, 18. 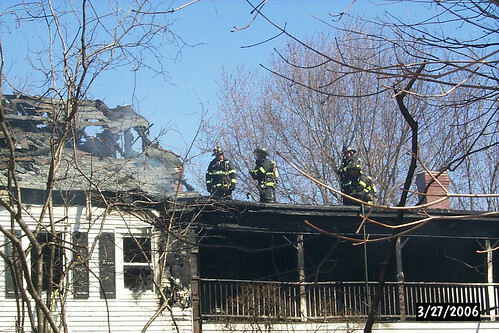 Only two people were home at the time of the fire, and no one was injured. Firefighters determined that the blaze started outside on the second-floor porch, but Dumas would not comment on a probable cause. 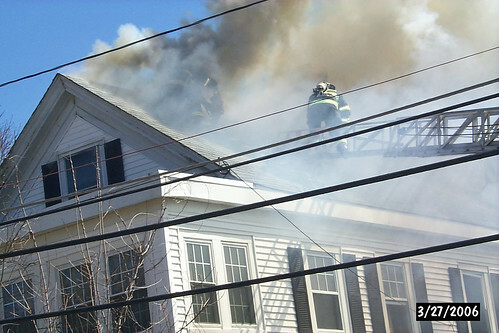 The fire quickly spread from the the rear of the home into the attic, where it raced toward the front of the house, Fire Capt. Tom Benrimo said. Eleanor Rankin, 79, was in her first-floor apartment when she began to smell smoke. Walking outside onto her porch, Rankin looked up and saw heavy plumes coming from the upstairs apartment. “She’s OK. She’s just a little nervous about what’s left in the house, and she’s lost all her prescriptions,” said Rankin’s daughter, Jane Johansen. Johansen teaches world history at the local high school and rushed to her mother’s side after receiving a call at school. “That’s not a call you like to get. I’m just happy that she’s all right and no one was hurt. She’ll come live with me now,” Johansen said. Joseph Sperry was also home when the fire broke out, though he declined to speak with The Sun. The blaze drew a crowd of spectators yesterday afternoon as motorists passed the scene, some stopping to take a look. Donna Sperry embraced her daughter, Courtney, as she came rushing down the street from the high school, both dropping to their knees in tears. 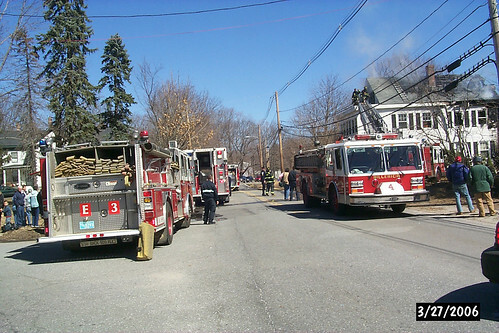 Their only look of relief came when firefighters emerged from the house two hours after the fire started carrying the family’s two cats, which were uninjured. Returning from work, the tenant of the third apartment looked on in disbelief wondering what had become of his belongings. Air Force Capt. Scott Hall’s first thoughts drifted toward his wedding photos. “My wife is out of town and she’s getting ready to deploy to Iraq. I don’t know if I can tell her this,” Hall said, his eyes transfixed on his apartment windows. Dumas and Building Inspector Milton Kinney both said the house would likely be condemned and would need to be either torn down or significantly remodeled. “These old buildings. They go quick. 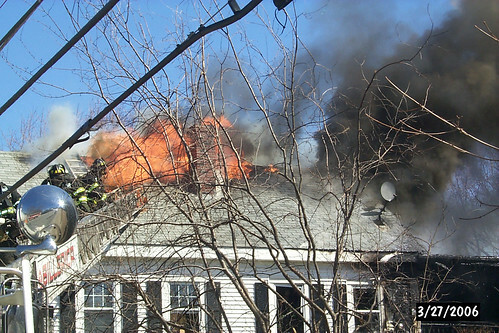 This is probably one of the oldest houses in town,” Kinney said. Next-door neighbor George Mylastname stood outside his home holding a camera as he watched firefighters chip away at the roof. His small blue ranch bears a plaque that reads “1813″ for the year it was built. He said neighbors call the now-charred white house the Mitchell House, after the family who once owned the home. yikes, that is too bad!! Wow! Great pictures. My husband’s a firefighter. When we were in college our apartment building caught on fire. Its taken me about 5 years now to stop hearing that roaring sound in my sleep. Fire totally scares the bajeezus out of me. That’s a serious looking fire there, such a pretty house too. That is so sad – I feel so bad for the people who lived there. My worst nightmare is something like that happening, and I’m so sorry for them. And the wedding photos, that just tugged right on my heartstrings. I’m also very curious to know why Joseph isn’t talking. Hm. Such a sad thing, but great pictures! “the apple doesnt fall from the tree” I see!!!! great pics from Dad!!!! are you the “elderly neighbor’s daughter? YOU MADE THE NEWS!!!!! I’ll have to show these to Luke as he is really into Firefighters. Pretty dramatic pictures. I feel bad for the people who lived there, at least they are okay. How sad! I’m glad everyone is okay though but still very sad. Again, that is very, very sad.